The Solo Traveller lid takes in to account human anatomy, ergonomics and functionality in a simple and elegant way. It is very hard to improve upon this form-follows-function design. There have been at least 40 different, individually-patented drink-through plastic cup lids created since 1934. 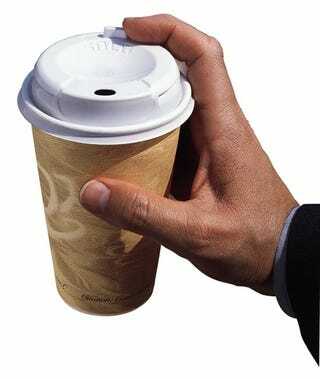 The styrene plastic hot beverage lid for Styrofoam and cardboard containers have been around since the early 1970s. Prior to this invention, a cardboard cup lid was the only option. To allow for ease of drinkability. 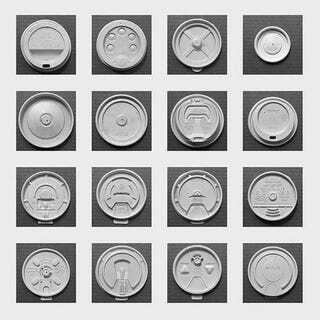 Examples of hot beverage lid designs. The Solo Traveller and copies display a clear easy of use functionality. Fully Closed - With this lid, the plastic is closed entirely with only a centre or side vapour escape hole. To use this lid system, the entire lid must be removed. The Pinch - With this lid, the plastic is scored. To use, the section is removed from the edge of the lid to allow beverage to be sipped. This is done by applied squeezing pressure to a gripping surface with a thumb and forefinger pinch. The Sweetheart corporation uses this system. The Puncture - With this lid, there is a raised element on the lid allowing a puncture to so that the beverage can be sipped. Also known as the Push and Drink lid. The Peel - With this lid, there is a removable wedge in the lid that runs to the edge of the cup fastening system. Radial score lines are used to define a central tear tab with predictable tears leaving the remainder of the lid on the container. The peel-and-lock lid is a vacation on this concept whereby the wedge can be folded back and locked on to the lid with a pressure clamp. The Pucker - With this lid, there is a raised area that can be access for sipping directly. The drinker places their mouth on the protruded polystyrene. The pucker lid requires the user to drink through the lid and not from the cup like the peel lids. The Solo Traveller is the primary example. There are variations to these designs, but there are not too many other options. Many of these design concepts are confusing and perhaps frustrating to use. Some designs are so poor that even in optimal cases the usability is suspect. Just about everyone has experienced this while trying to negotiate the hot beverage. In many cases, spillage and perhaps burns are a result of these poor designs. In most of these lid designs, the user’s anatomy — the tip of the nose and the protrusion of the upper lip — are not fully addressed. When drinking from a cup, the tips of our noses will come so close as to typically enter the cup if there is no lid. Thus with any lid system it is important to address the tip of the nose and the top lip. The Solo Traveller has addressed these issues most directly — and that is one of the reasons for the stellar success of the product. The Sweetheart Company has a competing product, the Sweetheart Gourmet lid; however it does not address the anatomy issues directly. On an ergonomic account alone the Solo Traveller is far more a superior design. This is accomplished by raising the lid surface about 1/2 inch above the edge of the cup. Most completing lid systems sit at or slightly below the edge of the cup and limit how these systems can solve typical lid usability issues. All disposable lid systems are not fully able to deal with heat transference and steam dispersion very well. The issue is really one of balancing the needs for this class of product. Other than being burned by a beverage that is too hot to drink, the largest complaint seems to be the pooling of steam that can be as hot as 48 C. Almost all lid systems have a small hole to aid in the venting of steam, but they are less then ideal as they must also be small enough to not allow too much beverage to escape. There is also the issue of cooling too rapidly to be balanced. In the case of the Solo Traveller there is actually a “Chimney effect” because of the upward angle on the drinking side of the lid. This is both a benefit and a problem. The “Chimney effect” will efficiently move steam up and out through the drinking hole and it is important to avoid drinking until a reasonable period of time has elapsed to allow the early venting as the beverage cools. The benefit is the Solo Traveller will accelerate this process by its design. One could design a system that is optimised for perfect cooling coefficients but this would create far higher costs. The Solo Traveller’s design is so well optimised there is little that can be done to improve the design. However there was one issue Solo could address: complete sealing by the lid to limit any inadvertent leakage. They took on this problem with the Solo Traveller Plus lid, designed for Solo by Metaphase Design Group of Saint Louis, MO. This is a luxury improvement to the classic Traveller lid that includes a sliding closure system. Using the same design firm that created the Microsoft 2.0 Mouse and the plastic Listerine bottle, Solo challenged Metaphase to create an innovation on the basic concept: to create an updated version of the classic Traveller cup lid. The design premise would be centred around the ability for the lid to be resealed so there would be little to no spillage of potentially hot liquid. This was not an easy problem to design for as cost and ease of use was one of the top priorities. The solution was to create a two piece lid that has a small sliding knob at the top of the lid. To open or close one would slide the knob and a mechanism inside the lid opens or closes the sip hole. This design was tested at a number of locations and became available in the United States in early 2004. The lid was an instant hit with high end coffee houses and restaurants. It went on to become an award-winning design and shown at museums events. The only issue was the cost — about 5p per cup in comparison to 1p for most versions of the classic Solo Traveller. With the Solo Traveller lid we see the crystallisation of how many competing design elements have been simultaneously addressed. There is a point of optimisation where a product cannot really be improved upon and I believe we see it with this product. As long as human anatomy does not radically change, cups continue to be the primary delivery system for beverages and gravity continues to work, I think we will continue to see the Solo Traveller on into the foreseeable future. Why is the Solo Traveler the dominant coffee cup lid? originally appeared on Quora. You can follow Quora on Twitter, Facebook, and Google+.